Ever wondered how the monetary system of the United States got into the fiat predicament it now finds itself? Did you know that American history has more often used some sort of gold or silver backing than not? 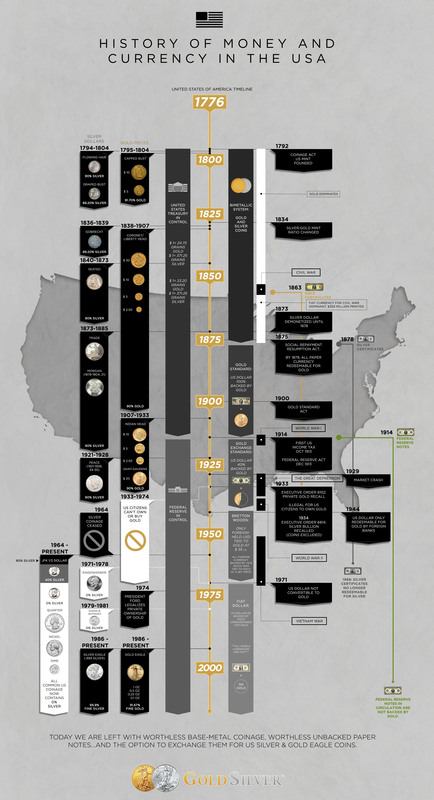 Inspired partly by GoldSilver.com reader Greg V, we created a scrollable infographic of the history of money in the US. What you'll see is that with each monetary change in the US, our currency has gradually been destroyed. We started with 100% gold-backed currency, but via the whims and machinations of politicians, we've ended up with 0% gold-backing. A currency that can be diluted at will; a currency that is ultimately worthless. How long will this fiat currency called the US dollar hold out? As Mike Maloney has pointed out numerous times, we are overdue for a global monetary reset, the likes of which will cause convulsions the world over. As you scroll through the history, an inescapable question comes to mind: which form of money would you rather hold — fiat paper, or physical gold and silver?